John Gisby ( 22 National titles and a World title) Steve Colbert (Winner NZ Pro Am) we'll reveal the secrets that powered them to surf legend status. If you don,t know who Maz Quinn is, check out the video below. For years coaches have been trying to pass on proven secrets to explode your surfing. They've tried to sharpen up your surfing ability with KILLER TECHNIQUES. And...despite their best efforts, thousands of surfers never discover what separates them from the guys who truly rip. Then I realized surfers needed a system that was exciting, quick and easy to use. CLICK on the tip or strategy you want to perfect then get instant answers as if you had your personal surf coach? Imagine no longer, the next to perfect surf coach is here. For the last four years Pro Surf Secrets has been taking surfers through a system that is proven to take your surfing to the next level. Couldn,t put PSS down. I check it out regularly before surfs and put some of the ideas into practice. It has totally changed my surf attack and I'm stoked with the results. My re-entries have improved 100% and my cutbacks are now developing real power. The system is simple. It doesn't require you to have great computer skills to drive it. It is on the cutting edge of surf development and its tips and techniques are used by the world's elite surfers proving Pro Surf Secrets works. 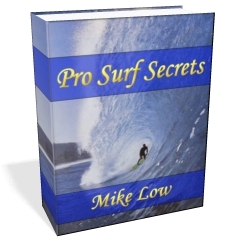 Once you have downloaded Pro Surf Secrets Simply click on a headline that interests you. Instantly served, will be the latest tips and strategies available for you to check out. Finally get out in the water and reap your rewards. Step 1 Open Pro Surf Secrets. Step 2 Click on a headline you want to perfect. Step 3 Get into the water and start ripping. This book has been very beneficial to me. It comes down to your mental approach. This book helps you get in tune with the correct approach needed to rip. I highly recommend this book to anybody with an open mind and is eager to improve. The surf coaches I know are usually frustrated. As well intentioned as they are, they know their students need many sessions that run into hundreds and hundreds of dollars and hours and hours of time. It was driving them crazy. They had to finally admit surfers aren't comfortable being seen to be coached or simply haven't the time or money to learn the ins and outs of successful surfing. So I finally got down and developed the Pro Surf Secrets system built to save you time and money and yet still reveal the best surfing secrets available. The only thing left to do is to get out on the water and into the surf mag cover shots. Pro Surf Secrets is the template to surfing excellence. While getting out there and surfing is important, if you want to develop your surfing to the best of your ability you need more than that. You need a plan and Pro Surf Secrets gives you the template to create that plan. Congratulations to Mike, he has created a surfing resource that is unique and long overdue. Anyone who reads Pro Surf Secrets and uses its suggestions, will produce results. Here's what Pro Surf Secrets includes. · Ways to create 65% more speed than the average surfer. ways you can tap into its power. to squeeze every last ounce of speed. · Helpful tips to get your re-entries vertical and extreme. Just check out the photo shots and follow the examples. · Instant point and click access to the secrets that set your surfing on fire. No need to finger through pages and pages trying to find that valuable tip. · Pro Surf Secrets is yours to keep forever. It sits on your computer. checking it out. It's yours to keep using over and over again whenever you feel like it. You can print out a hard copy if that's what you want. Now you can get your own personal coach on call 24 hours a day ready to guide you through floaters, cutbacks, carving, speed paddling and heaps more. We put you into the mind of the Professional Surfer showing how they prepare for the big events where thousands and thousand of dollars are up for grabs. for that wipe out that has you thinking, it's all over. feed back from top surfer from around the world. This information is tested to see if the results are delivered and only then does it have a chance of making it into Pro Surf Secrets. to make complex moves simple. to locate the best surf in your area. that covers surf stuff. What's so special about Pro Surf Secrets? A. Nearly all other surf books are written by one person. Champions and one of the worlds top shapers. For that special surf tip. contained in Pro Surf Secrets. the pace you want to work at. Q. Mike, what level is PSS aimed at? Q. Mike do I need to be a computer wiz to use the Pro Surf Secrets system? Here is the price and what you receive. Now I'm not saying that PSS has the ability to instantly turn you into a surf superstar. with top surf coaches, one on one and with unlimited hours. used by the best surfers on the pro circuit. Saving you hundreds of wasted hours on the water or paying expensive coaching fees. Just spend a few minutes each day going over a couple of key areas you want to improve on and before you know it your surf ability will start to sizzle. And the best part is you can do it over and over when ever it suits you. If you hired a professional coach, you'd be looking at hundreds and hundreds of dollars for only a few short sessions. But with PSS you can have unlimited 7/11 access to only the best secrets available for one ridiculously low fee. -Paddle with more speed and power. -Create moves that have the x factor. use to wow the judges. A 5 emails series that went out to opt in Surfers. This email series had surfers emailing us and begging for more. It covers a range of surfing topics and tips and is designed to entertain while sharing valuable information. As you know surfing is continually progressing and at PSS We're committed to keeping up with the latest tips. As a Bonus send us your email address and we'll email you any test additions to PSS for the next 12 months. Your 8 week Iron Clad Guarantee. Here's what New Zealand Surf Magazine (New Zealand's Premier Surf Mag) had to say about Pro Surf Secrets. Mike Low has produced one of the most comprehensive guides to advancing your surfing, there's information and motivation for all surfers at all levels. If you want to get better at surfing, and who doesn't, then Pro Surf Secrets will be a vital tool. I guarantee that once you have put Pro Surf Secrets into action for thirty days your surfing will start to improve so that even your friends will start to wonder what you're on. Now the question you have to ask yourself is, is it worth 27 bucks to own a system that lets you in on top secret information that the average surfer will never find out about. You deserve a crack at surfing more radical than you ever dreamed of. Believe me, you'll no longer have the fear of kooking it in front of your mates let alone the rest of the surf community. Your surfing will enter a new dimension of speed, power and style. I personally have seen the electrifying results of PSS put into action.I know the difference just one change in your surfing can bring about but times this by over seventy and your surfing will explode. If you can point and click with your mouse and your prepared to put the tips and techniques into action, your surfing can not help but come on in titanic leaps and bounds. The heart and soul of any hot surfer begins with what's inside his/her head . It's the driving force. If you aren't willing to spend 27 dollars for that then you really don't understand what separates the top surfers from the rest of the rat pack. In which case you really need the software. So don't delay. Sign up for Pro Surf Secrets and get started. Create your surfing future in the next 5 minutes and begin pulling off those sick moves you see in the magazines. Remember there is absolutely no risk. You have 8 weeks to try Pro Surf Secrets for yourself. Use its proven system to start adding more power, speed and sharpness to your moves and if you don't see an impact on your surfing in 8 weeks, contact me for a refund. PS To claim your Bonuses, be sure that you claim the Pro Surf Secrets Solution today. Remember the bonus is yours to keep no matter what you decide. PSS People want to know, will I have to keep referring to PSS forever to stay at the top of my game? While to begin with you will probably visit Pro Surf Secrets regularly, after a while, you will master its walk you through coaching style. Pro Surfers certainly don't have to follow the how to steps as they shred waves to pieces. But they certainly reflect on the basics they mastered before becoming an expert. Experience and common sense will teach you how regularly you consult with Pro Surf Secrets. The biggest benefit you'll get through hands on experience, is it teaches you how to think for yourself in making surf decisions. Of course this is second nature for Pro Surfers and hopefully one day it will be to you to. I want to say how much my surfing has improved and I have only been reading your book for a couple of weeks. The only surf book that backs its promise to deliver with a money back Guarantee.